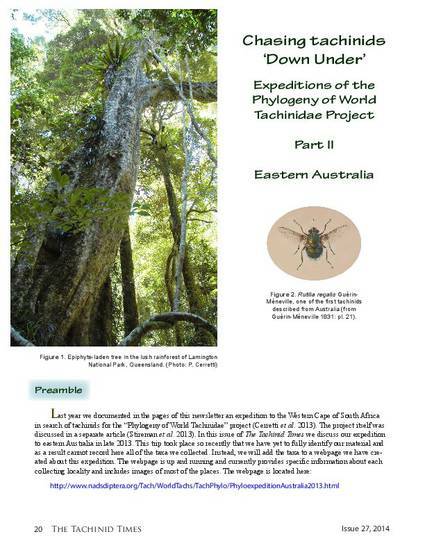 Last year we documented in the pages of this newsletter an expedition to the Western Cape of South Africa in search of tachinids for the “Phylogeny of World Tachinidae” project (Cerretti et al. 2013). The project itself was discussed in a separate article (Stireman et al. 2013). In this issue of The Tachinid Times we discuss our expedition to eastern Australia in late 2013. This trip took place so recently that we have yet to fully identify our material and as a result cannot record here all of the taxa we collected. Instead, we will add the taxa to a webpage we have created about this expedition. The webpage is up and running and currently provides specific information about each collecting locality and includes images of most of the places.